I've been looking back through my most recent posts and I notice that there's an awful lot of birds and nothing much else. 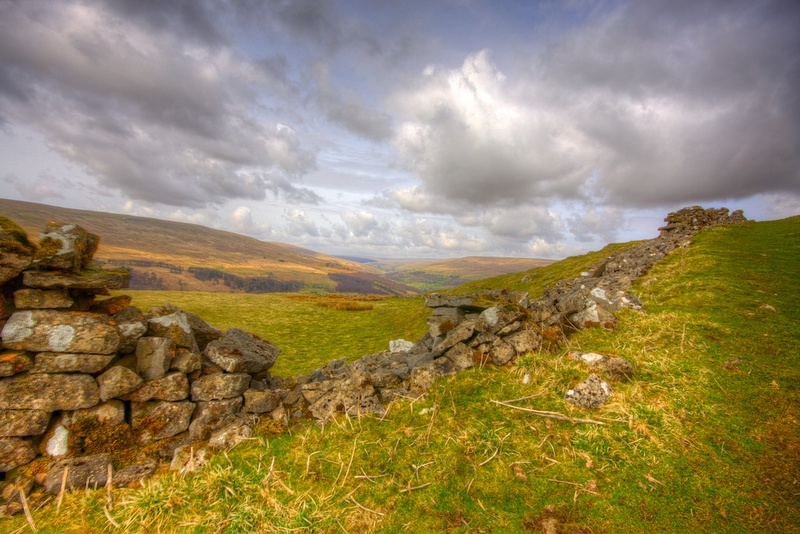 So in this post and the next I will concentrate on the landscape and things I see as I'm walking around. 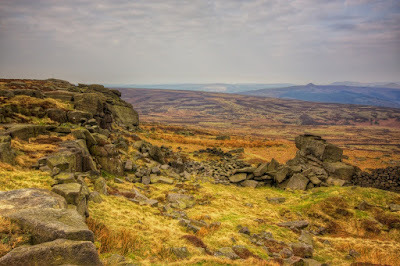 Carrying on from my last post I was in Stanage which as I have mentioned in a previous post is derived from Stone Edge, which describes this place very well. 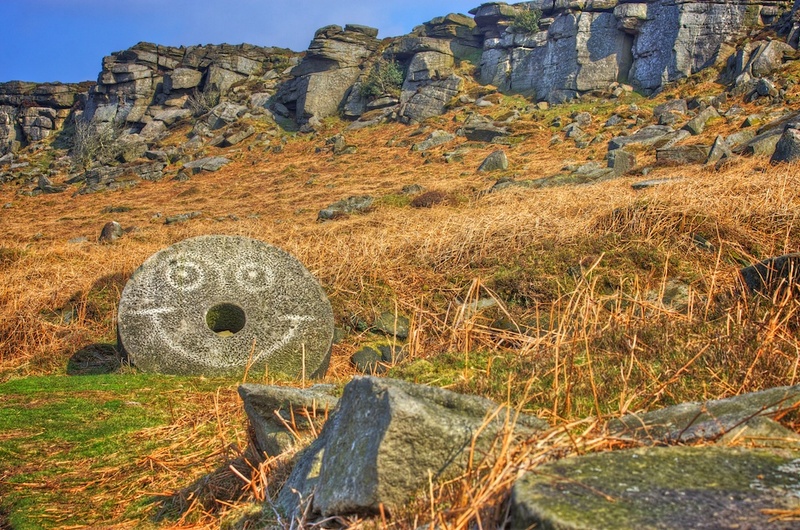 The stone edge is very popular with climbers and the paths along the top and bottom of the edge is popular with walkers and runners. When I set of from home the sky was a bit cloudy but it looked as though it was going to brighten up. 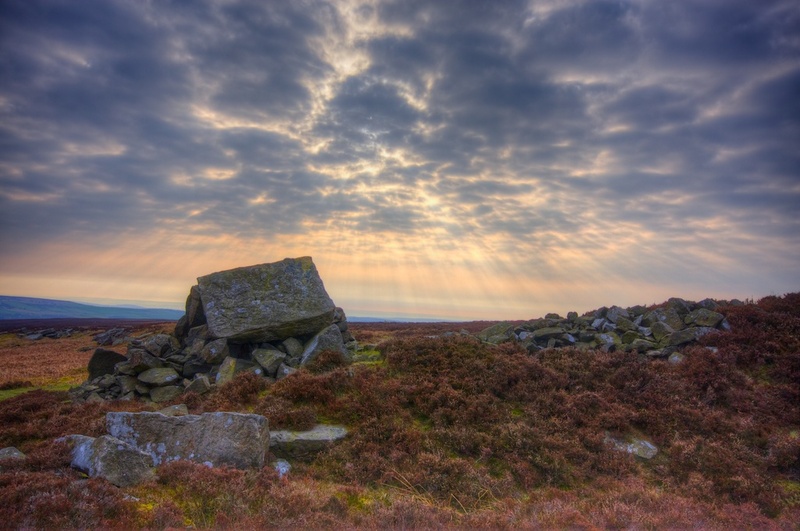 When I arrived at Stanage the clouds had increased and was just letting little shafts of light through. 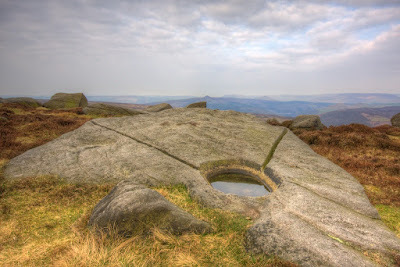 The first two images were taken on the top of the edge in an area where there are a few big rocks. I have used the rocks as a foreground and am looking into the sky to see the God rays. Looking in the opposite direction near here there is an old wall that stretches a little way along to where the ridge begins. In the background is a view of an area of the Peak National Park. This is where the path splits between the one along the top of the ridge and the one that goes along below the ridge. 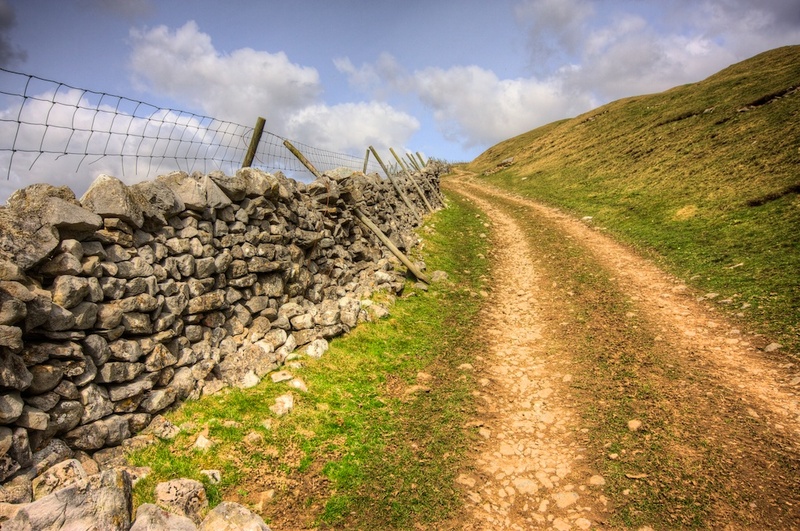 I had decided to walk for a while along the top and then come back on the lower path. There is what could be a gatepost with W W on it but I don't know why. 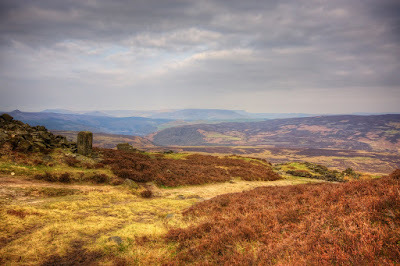 If you click on the image to make it bigger you might just be able to make out a part of Ladybower Reservoir in the distance just to the right of the post. A little way along the ridge I took this panorama looking over the edge with more of the Peak National Park in the background. 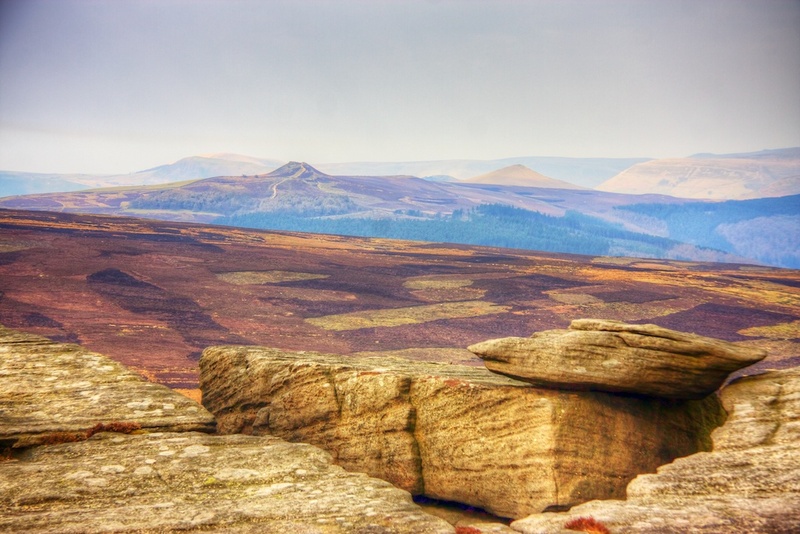 A bit of Ladybower Reservoir is in the middle of the photo and behind and to the left is Kinder Scout, the highest peak in the park I think. Oddly the cloud was getting thicker but then there were bigger breaks of blue sky. Along the ridge there are a lot of water holes cut into the rocks which I guess is to provide water for the livestock that roam about up here. I quite like the way the grooves are cut into the rock to guide the water into the trough. It has been quite dry for a while so most of the troughs are empty but this one had a bit of water in it. I was trying to get the reflection of the sky into the water for this image. 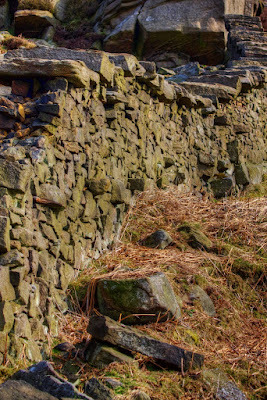 In the next image is another part of the old wall and the beginning of the higher bits of the ridge. Further along the ridge again and another view across towards Kinder Scout. It's hard to tell but beyond the rocks in the foreground is a drop of about fifty foot down a sheer rock face. On the way back I dropped down to the lower path and I took this picture of another old wall. It's quite hard to tell in the image but the wall goes up a very steep bank and meets up with the base of the rock face. The big flat stones on top of the wall look a bit like stairs. In a previous trip to a different part of the stone edge I had seen a few old mill stones which had been abandoned. 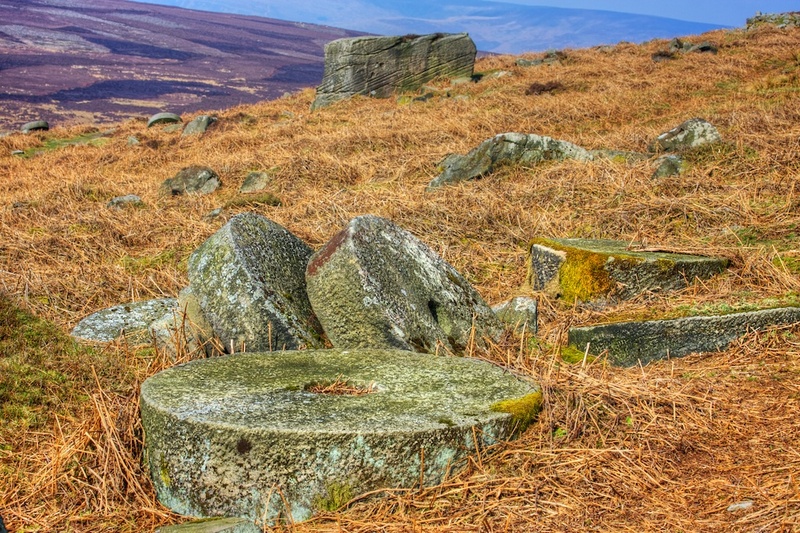 I guess they used to make them here and at some time production stopped and all the stock of millstones were just left here. 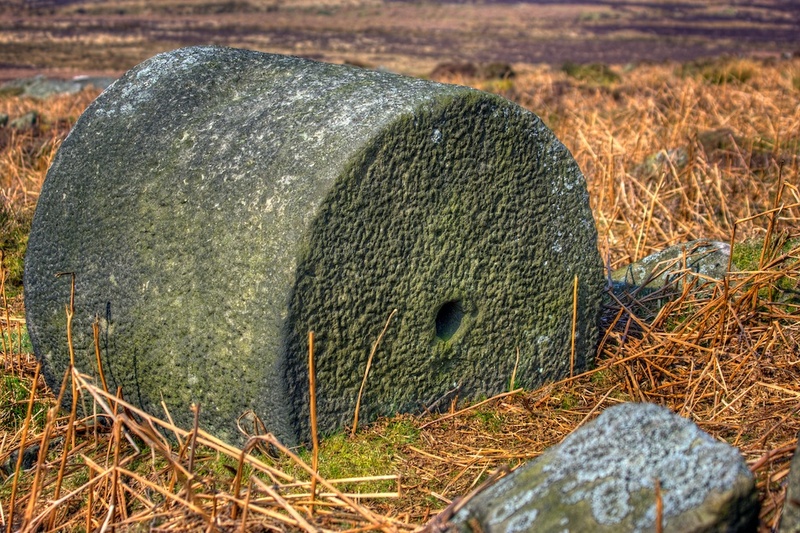 I think this stone must be for a roller rather than a millstone, unless they make them like this and then cut them down to size. Near the roller there were a few other millstones so a took quite a few photos here. 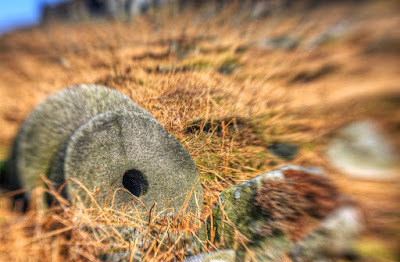 For this next one I used my Lensbaby to throw the area around the stones out of focus. As I walked further along the path there were more and more millstones scattered across a wide area. There must have been around a hundred that I saw just lying around or piled up in twos and threes. Eventually they became less of a novelty and I got a bit fed up of making pictures of them. They were all different sizes and I saw a couple that had no hole in the middle which was a bit unusual. 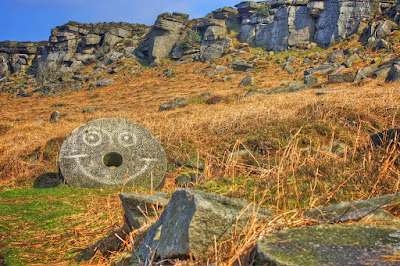 Towards the end of the path someone had cleaned the dirt of one of the stones to make this smiley face. 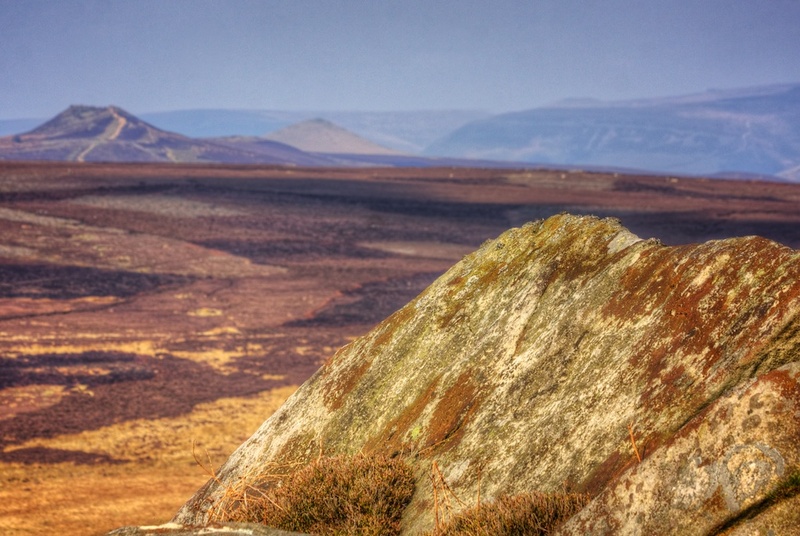 In the background there is a bit of the stone edge. I just realized that I didn't take many pictures of the rock face, maybe next time I come here I will take a few more. In the last image I was trying to get a rock in the foreground to mirror Kinder Scout in the background. I tried a few different rocks and I think this one turned out the best. Next time the photos will be mainly bits of waterfalls taken at Woodhead. 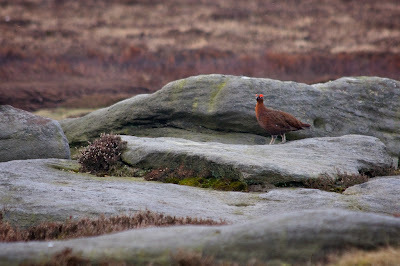 On Sunday I went to Stanage edge to take some photographs of the landscape and some of the birds. 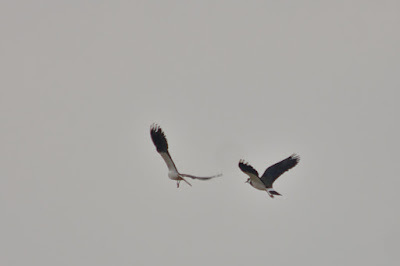 In this post I will just show the birds as I took a lot of photos and I haven't finished processing them yet. It gets quite busy along the edge with the walkers, runners, cyclists and climbers that use this area and so I guess the birds get used to people being around. 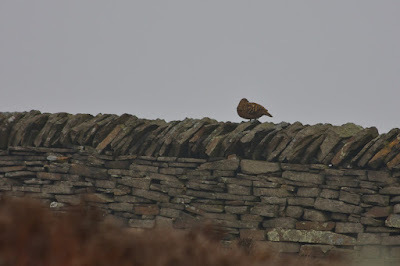 A couple of years ago I caught a good image of a grouse perched on top of a rock sticking out of the bracken. 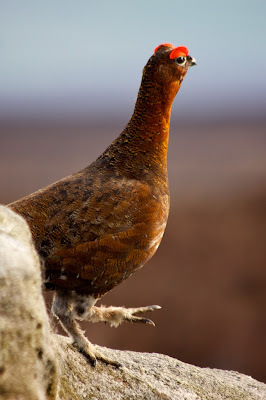 On the moorland above where I live the grouse don't let you get close enough to get any decent shots, I guess they're used to being shot with guns rather than cameras. In this first image this red grouse was happily chirping away as it sat in the grass. I chose this picture from the bunch that I took because it had its beak open as it sang. A little further along this next grouse was hopping along all over these rocks and keeping a close eye on me as I moved towards it. It flew off before I got very close. 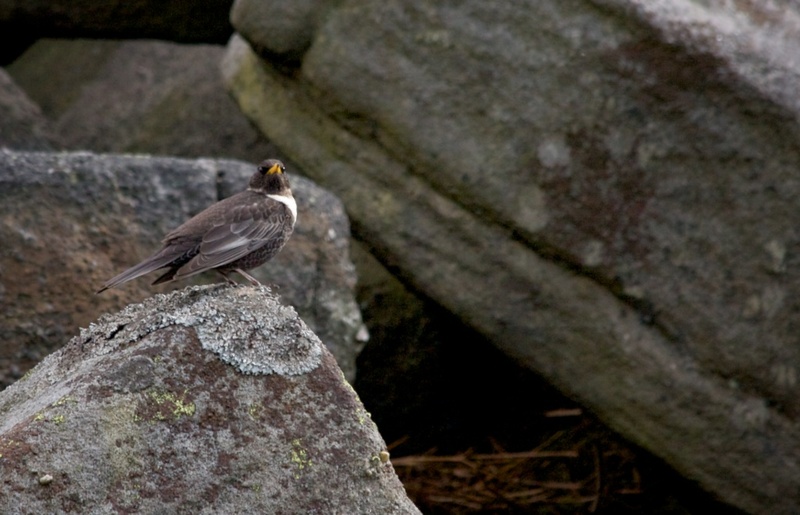 This next one was perched on top of the highest point on a group of rocks looking quite pleased with itself. As I was walking along I just caught in the corner of my eye this grouse peering out at me from behind a rock. 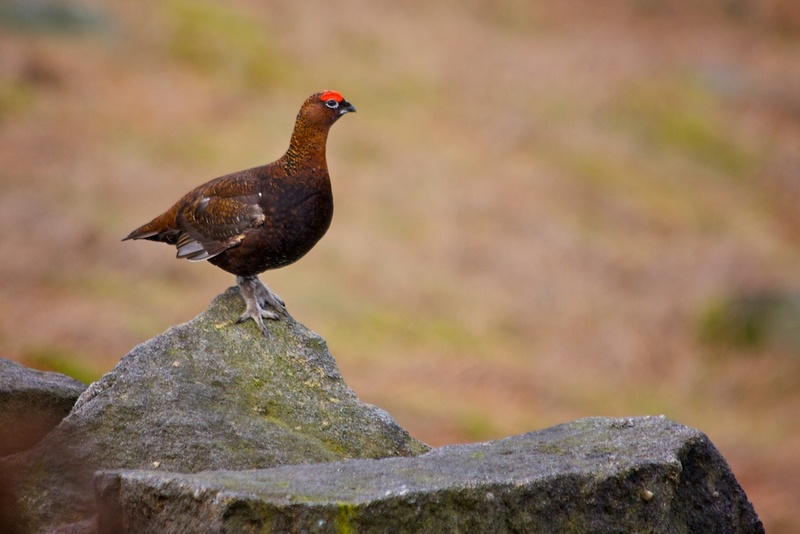 As I moved towards it, it strutted out from behind the rock and into the sunshine to have its photo taken. 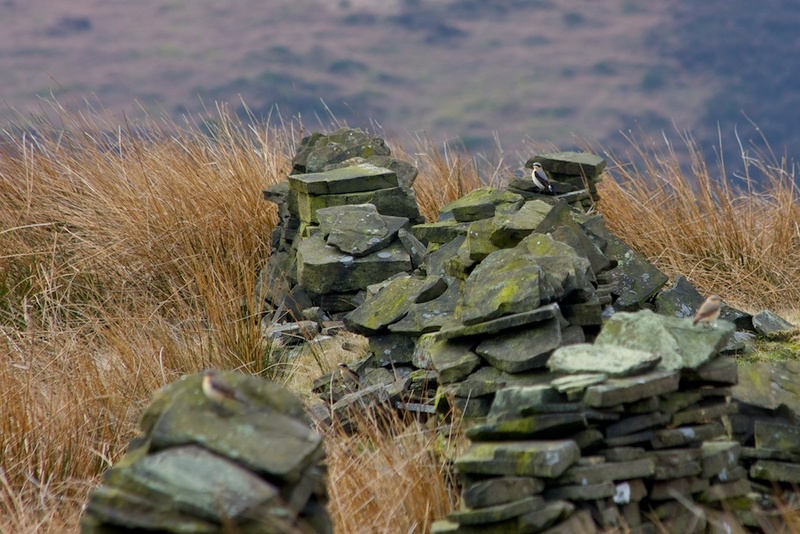 When I got to the furthest point on my walk I was a bird watcher looking down the hillside with his binoculars. Now in my previous experiences with bird watches they are a very strange bunch, but this guy looked pretty normal so I went over to speak with him. 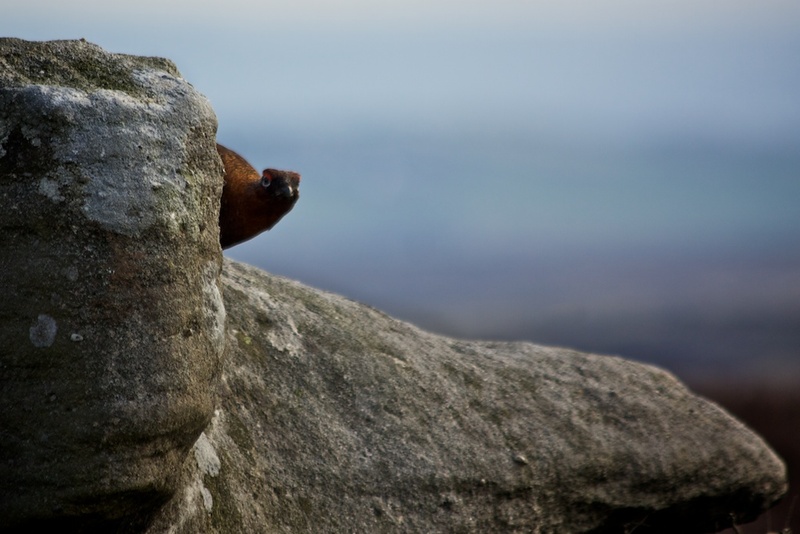 I asked him what he was watching and he said he was looking at some ring ouzels. I must admit I thought he was pulling my leg, I always linked the ouzel bird with comedy sketches which were on the television when I was a kid. He said that I had disturbed a pair of birds as I had walked down the path towards him so I apologised but he said it didn't matter as they would come back once I had gone. We chatted for a while and then I said I had to move on. I still wasn't convinced about the ousel bird so I asked him what I should watch out for as I went down the path. 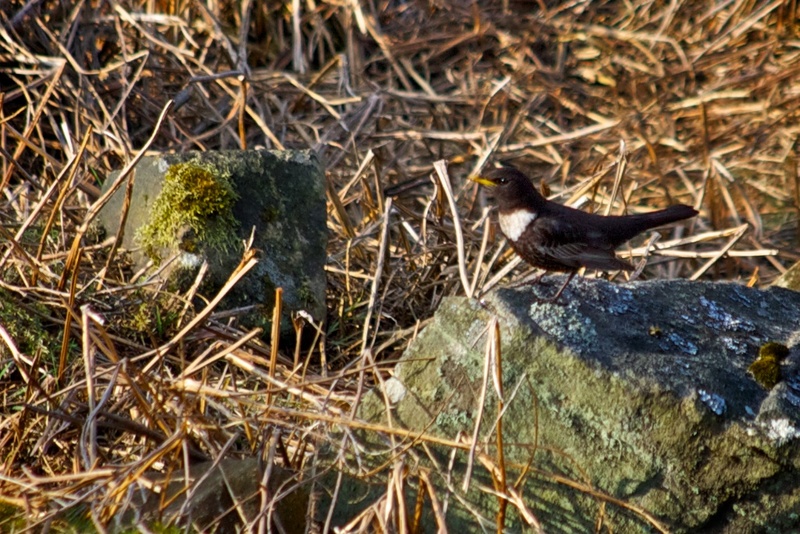 He started to tell me that they looked like blackbirds but with a white bib and then he pulled me towards the edge and pointed to a tree down in the field next to the path. I put my camera up to my eye and used the long telephoto to get a closer look and I could just make out what he was looking at. We chatted bit more and then when we looked at the tree again the bird had gone, he said it's probably just dropped down to the floor to feed. He said that I should look over the edge as I went past them but I said I didn't want to disturb them any more for him. He said it's OK they won't go far. So as I walked down the path I looked over the edge by the tree but I couldn't see the bird, but then about twenty yards further down I spotted the pair of them down in the grass. The male bird was perched up on a rock and the female was hopping along the ground. 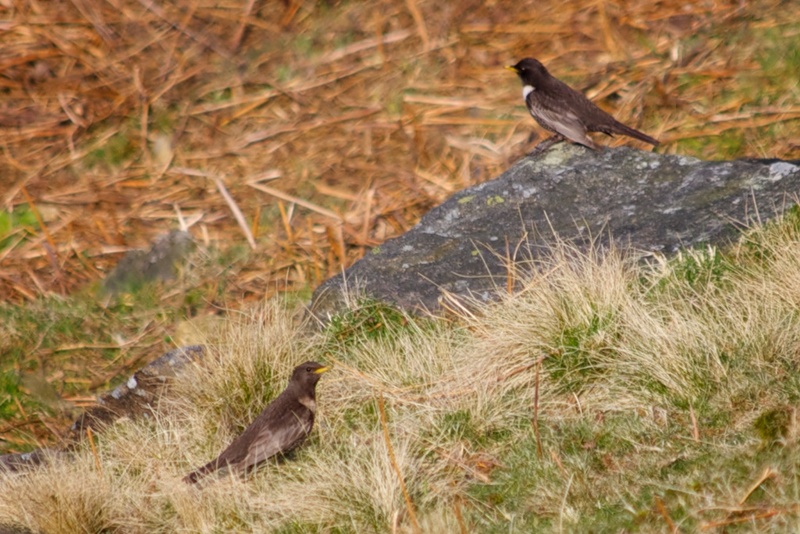 As I watched them the female continued to hop along past the male bird. 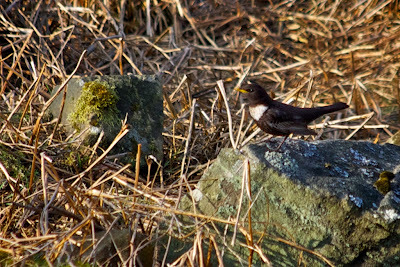 The male bird then flew to a different rock that was a little closer to me where I got this next shot. About a couple of miles away from this first sighting I spotted another pair of ring ouzels up in the rocks at the bottom of the ridge where I took this las image of the ouzels. 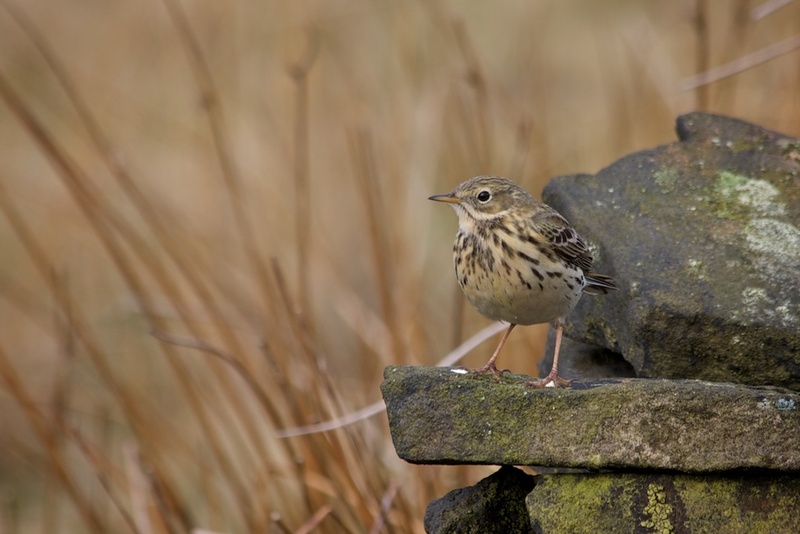 In the rest of the walk the only birds I got close enough to to photograph where the meadow pipits like the ones I had seen last week near Digley reservoir. There were quite a few of them and they seemed quite keen to have their photograph taken. During the walk I had seen some other birds but hadn't managed to take any decent photographs of them. 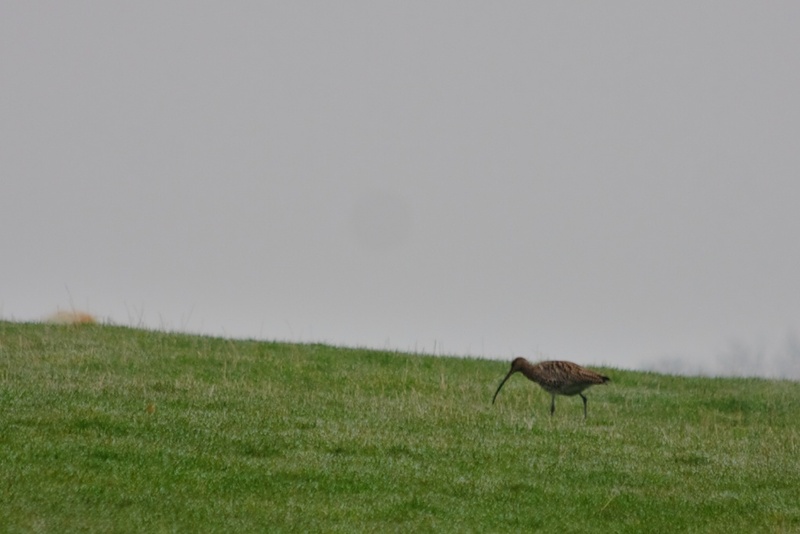 There was a golden plover running along the grass with what I thought was a young bird. I mentioned it to the bird watcher but he was doubtful that there would be any chicks yet this year. I could hear plenty of curlew in the distance but I never caught a glimpse of any. There was also a hunting bird of some description. I'd heard it squawking but couldn't spot it. Then all of a sudden I saw it flying along quite close to the ground. I wasn't close enough to identify what it was and I took some photos but they were too blurred to make anything out. 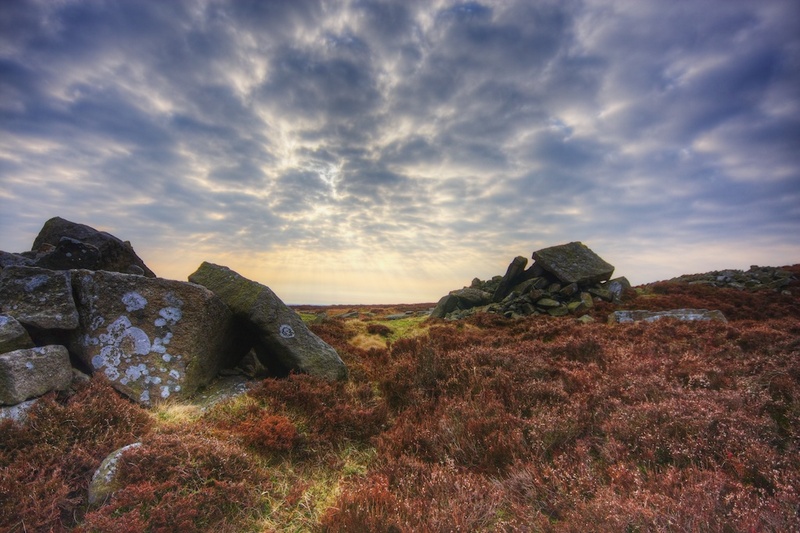 Next time I'll post some landscape photos. Although the weather had seemed promising when I set off from home it was quite variable while I was walking so there is a pretty mixed bunch. It's almost exactly a year ago that I made a rant on my blog about why I'm not a wildlife photographer, yet one year on here I am with a post using birdwatching in the title. Not only that, but in the last twelve months I have posted many images of animals and birds on my blog and also have hundreds more that haven't been posted. So what's changed? Well, nothing really. 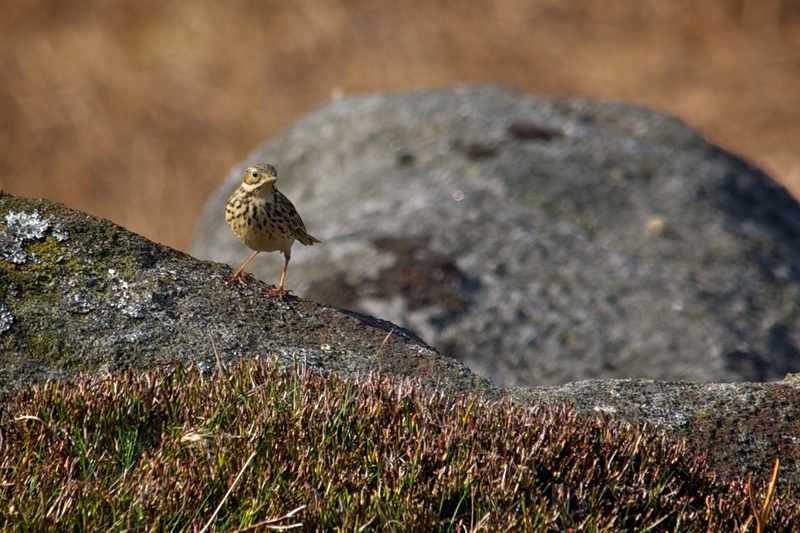 I still think that birdwatchers are weird and I still can't justify spending thousands of pounds on big telephoto lenses, but there's just something about seeing and photographing birds and animals in their environment. Even if I had an inexhaustible amount of spare cash and spare time I still don't think could go down this route, but I always enjoy doing something different and trying to get better at it. 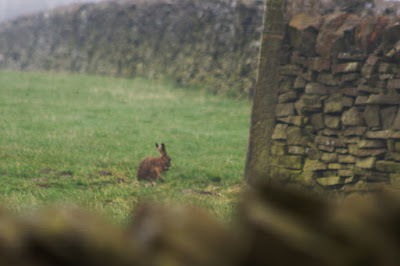 So Sunday morning I set off fairly early with the intention of photographing Curlew and Lapwing up on the fields and meadows above Digley Reservoir. I've made photographs of these birds here last year and have been waiting for them to arrive this summer from wherever they go in the winter. Although it was quite nice when I set off the low cloud on the top of the Pennines made it quite foggy where I was heading. I had arranged to pop into Mosley to drop off my daughters phone charger which she had left at our house so I carried on along the A635, dropped off the charger and then came back. Luckily the cloud had lifted enough for me to stop and seek out the birds. I parked in a little lay by near an old lane (Magdalen Road) where I have seen Curlew and Lapwing before. 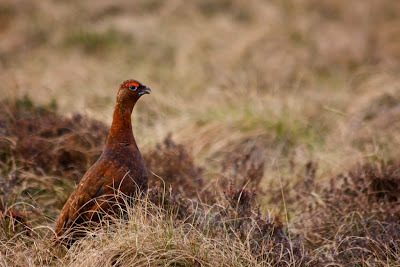 I could hear the birds I was searching for and also the grouse who live here all year around. My first sighting was of a couple of grouse sat on the wall and I managed to get this first image before they flew off. I could see a few Curlew and Lapwing in the distance so I headed toward them. Sometimes they land in the fields and wander around so I kept looking over the walls to see if I could spot any. But all I could see was this little rabbit sat at the edge of the field. I guess the birds were being a bit shy today because as I walked down the track they got further away. So I started walking back to the road when I spotted one of the Curlew land in the field. I sneaked up quietly and managed to get quite a few shots of it wandering across the field and occasionally pecking at the ground. I carried on back to the road and then went down another track at the other side (Springs Road). 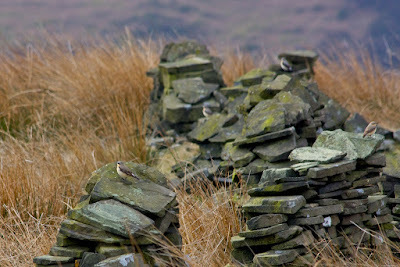 When I first parked the car I had seen some lapwing flying about down this side of the road so I went looking for them. 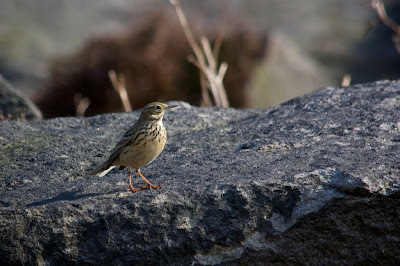 I could see a pair of them flitting around but they move so fast and randomly in the air they are quite hard to catch. Here's a little clip of the pair flying around. I took lots of shots that just didn't turn out right. I made the same mistake as before by not having a fast enough shutter speed to get shots that weren't blurred. Eventually I got a few acceptable shots so here are a couple of the pair in flight. 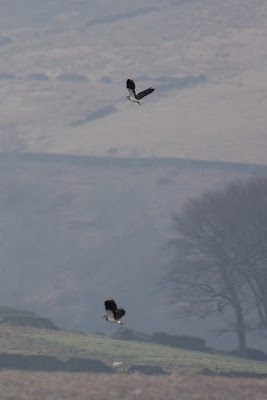 One of the Lapwing landed in the field behind me so I set off towards it to see if I could get a better shot of it. It was too far off and I could tell that if I headed towards it then it would just fly off. 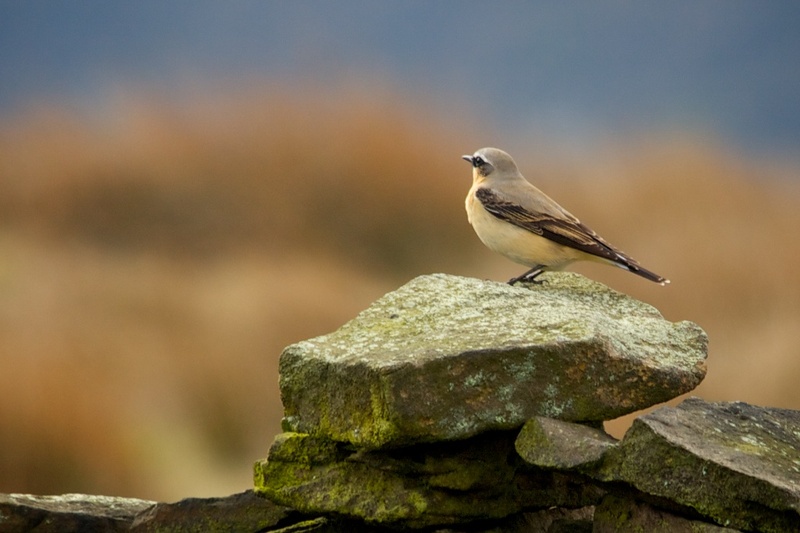 I turned around and there behind me was this little Wheatear sat on the wall. I took quite a few shots of it before it left but I liked this one the most because there is just a hint of catchlight in its eye. (click to get a bigger picture). 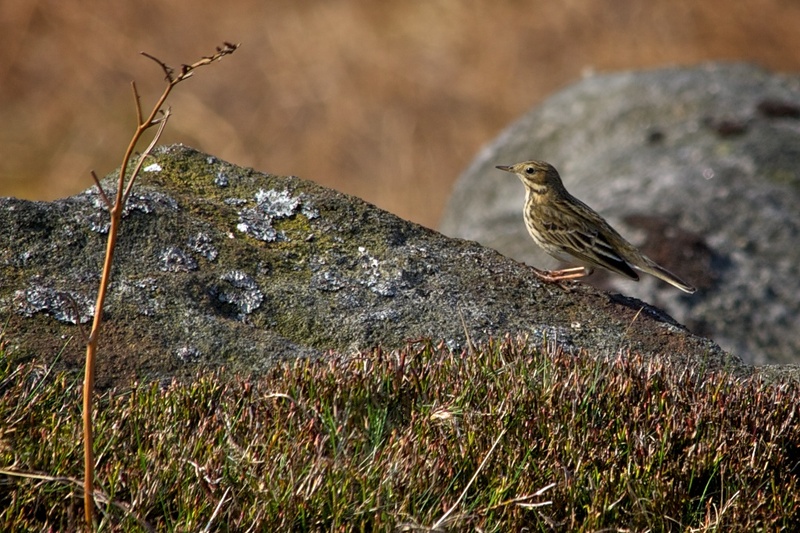 From the colouring of this bird it is either a female or a juvenile, the male is more of a grey/blue colour. When it flew off it went to join up with another three of its friends. I followed it and managed to get these next two shots. 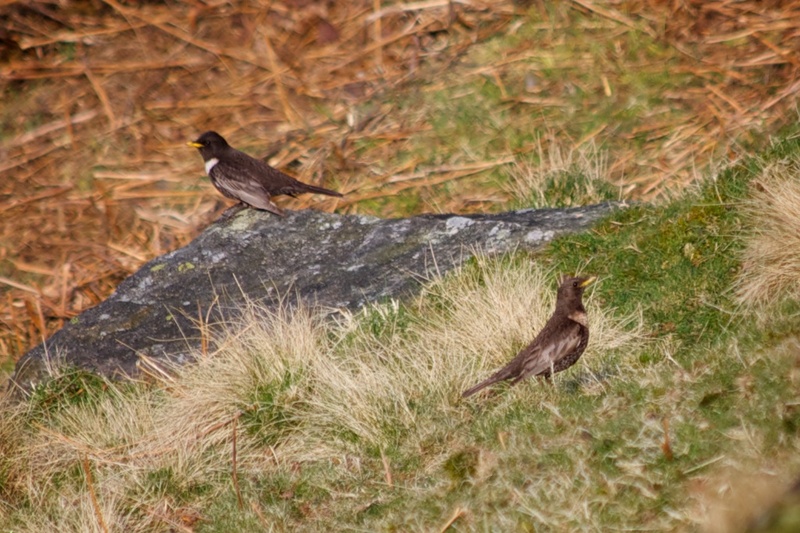 Essentially they are the same shot but on the first one the male bird at the back is in focus and on the second the female at the front is in focus. 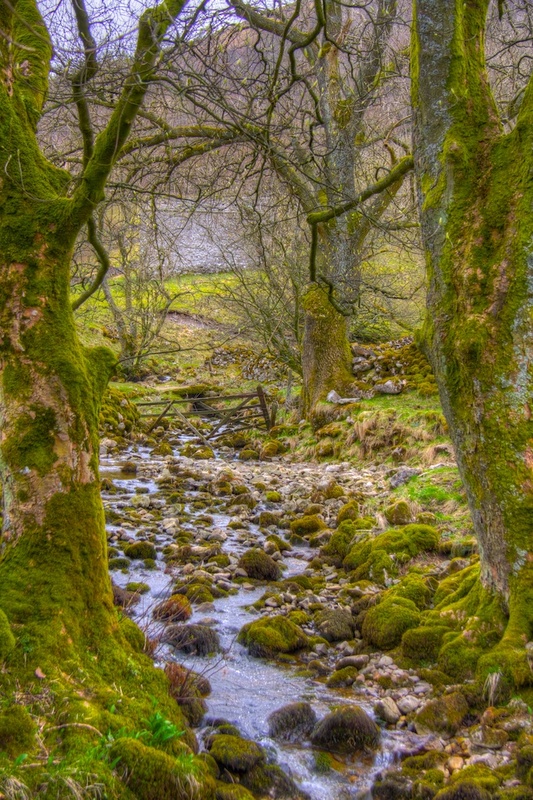 I think it might be possible to merge these in Photoshop to get them both in focus in one image but then there would still have a blurred bit in the middle. As I headed back towards the road this little Meadow Pipit stood on the wall posing for its photo taking. I have a few pictures of these little precocious birds over the last year or so. One of them with Evey the dog about a foot away from it and another with the bird stood on top of a post with a beak full of insects. I had only identified them as little brown birds before but this time I think I have an accurate id. So there we are, a couple of hours sat in a field trying to get pictures of birds then home for breakfast. Not a bad life really. 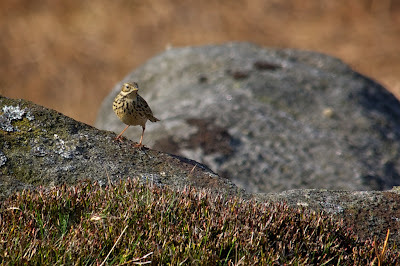 Could I have got some better shots with a £7000 lens? Yes probably. Would I still be married? Possibly not, who knows. It doesn't look as though I'm going to get the motivation to catch up with the photos I've missed so I thought I'd make a post from last weekend. 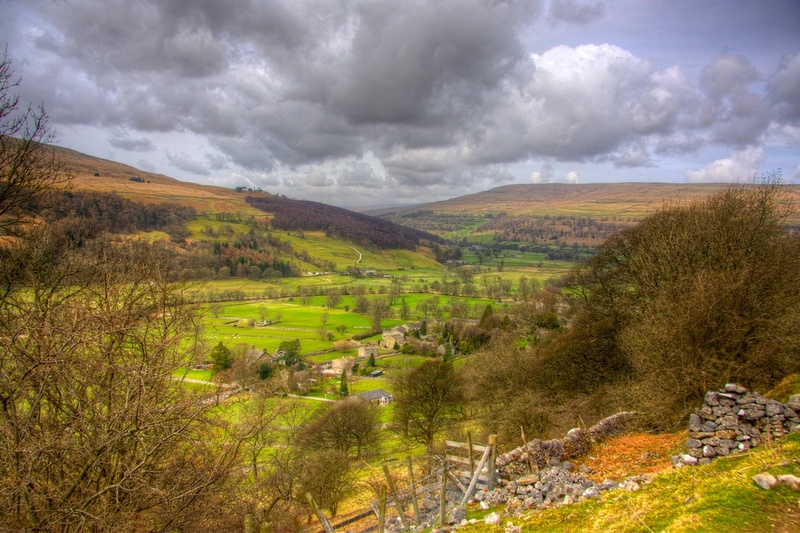 I had a long weekend with having Friday as vacation and we had a family visit to the Yorkshire Dales. It's quite a treat because it's not that often that we get together for a trip out now that the girls have both left home. Not only that, but the weather was just about right for a nice walk and take a few snaps along the way. 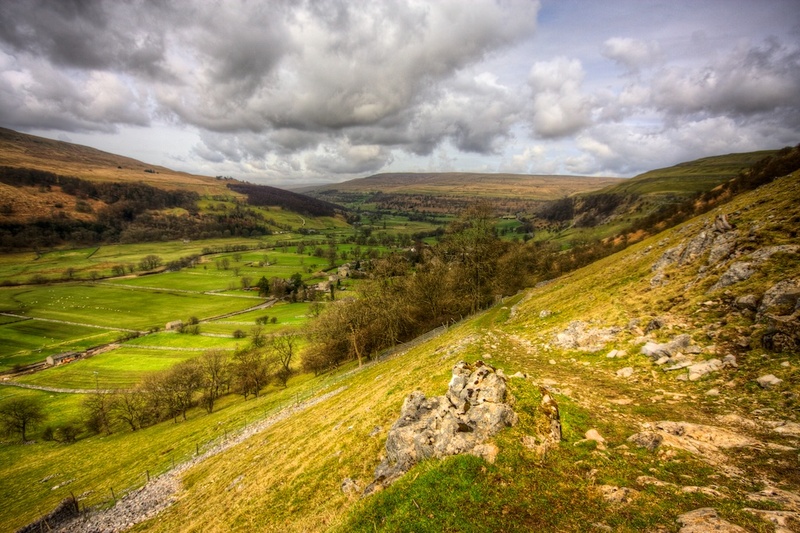 I had found a website (can't remember the details) which had a circular route from Buckden to Starbotton and back which had the written details and also the route marked out on an Ordinance Survey map. So we drove up to the car park at Buckden which was the starting point of the route. 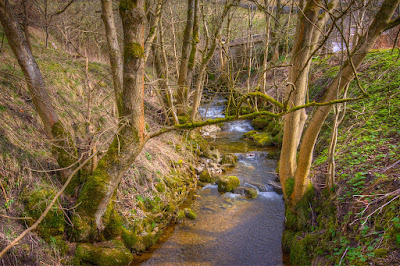 Close to the car park we had to cross a stream behind the village which is where I made this first image. 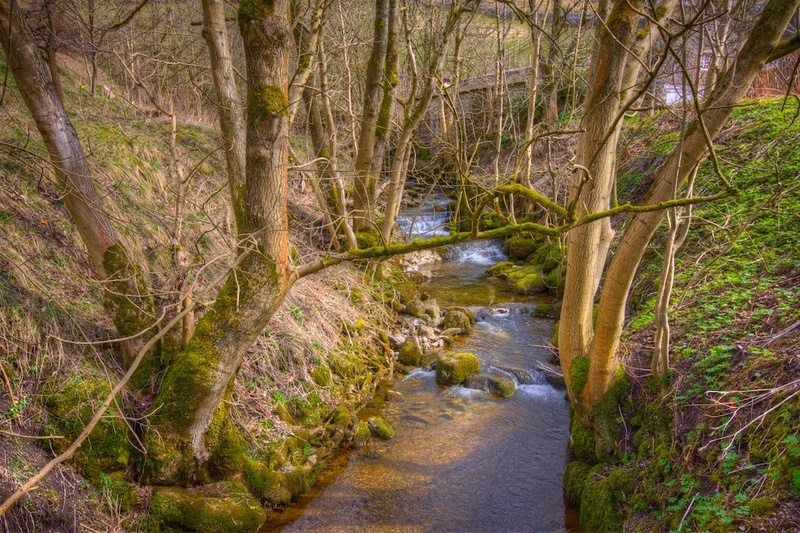 From the stream we headed up the steep valley side on a path which was signposted to the old lead mines. 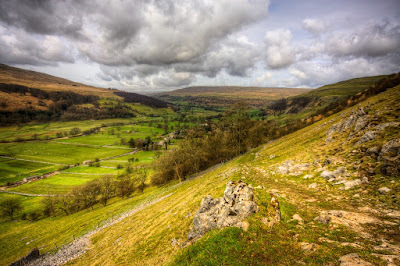 The next two images are looking down the path back towards the village of Buckden. I only wanted to post one of these images but I couldn't choose between them so ended up adding them both. We had to keep stopping so that my wife Lynne and Emma my oldest girl could catch their breath as they are not used to these sorts of climbs. Ginny and I were fine but I took this stop as an opportunity to put my very wide angle lens onto the camera so I could make the next few images. At the top of the climb we reached a path which went from Starbotton to the lead mines where we took another rest. From here we were going to take the Starbotton direction which was fairly flat before dropping back down into the valley near the village. This next image gives an idea of the flat ridge on which we were now stood. 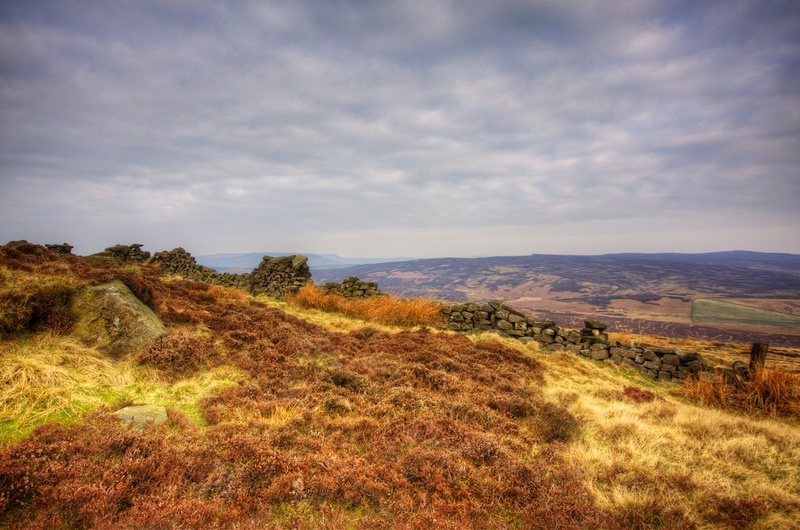 On the right of the image is the path that continued upwards towards the lead mines. 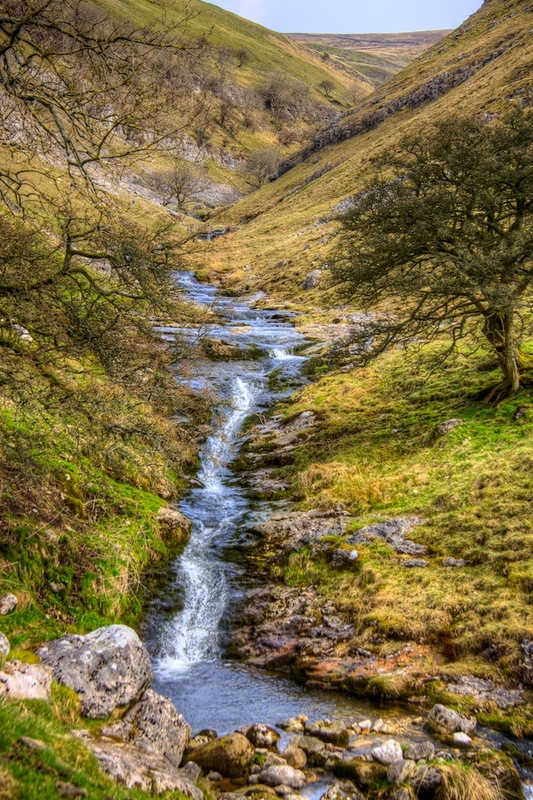 The walk along the flat ridge was quite wet under foot but the sun had come out a bit more and it was quite warm. As we came closer to Starbotton the path started to descend slowly through the fields. This next image is looking back up the path from where we had come down. 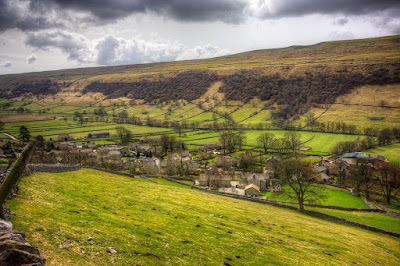 At the end of the fields we joined a track heading very steeply down towards Starbotton. 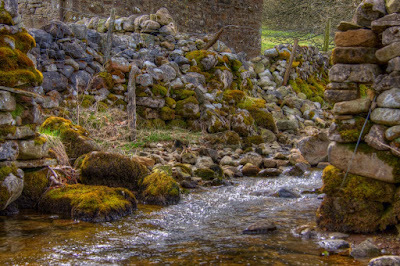 This photo is looking over the wall down into the village. Looking back up the track you might get an idea of how very steep this hill was to come down. It was quite painful on the knees and the loose surface on parts of the track really didn't help. At the bottom of the track we crossed a bridge over this little stream on the edge of the village. I the village we made for the Fox and Hounds for lunch and a couple of beers. Lovely pub food which we were able to eat outside in the sunshine. Spent a while here as it was such a nice spot to sit and chat. 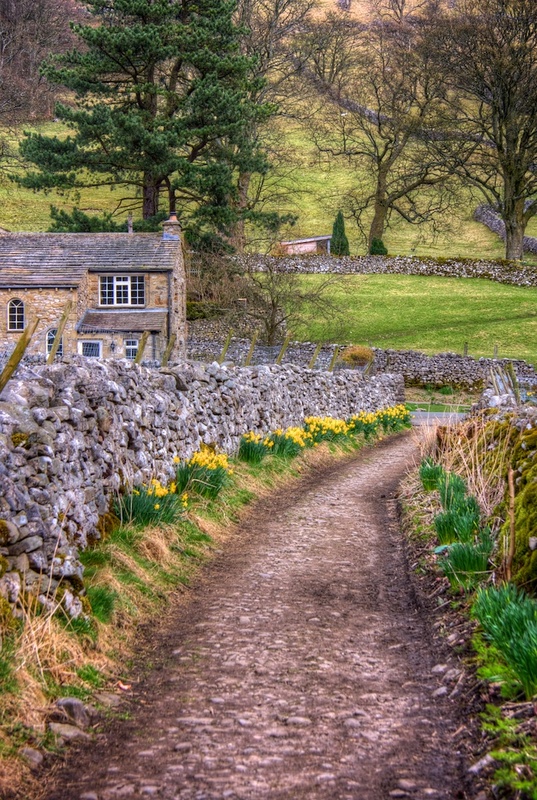 After lunch we headed through the village and out onto this path which leads to the River Wharfe. 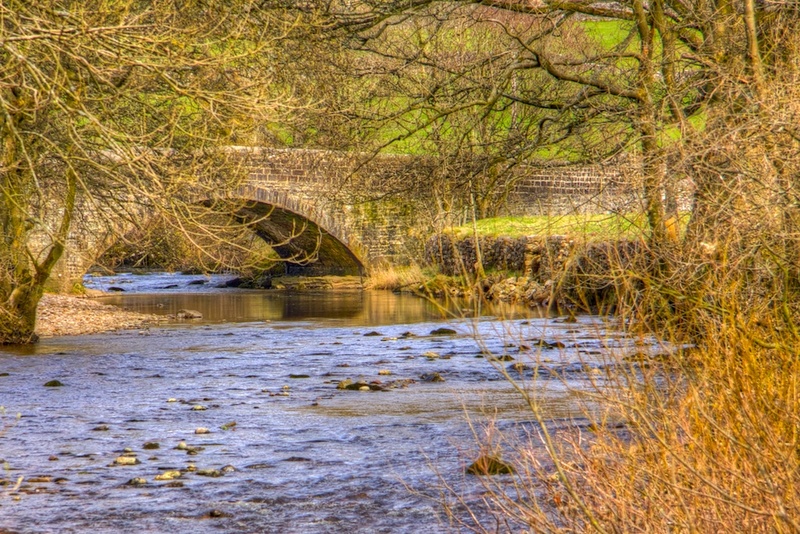 We crossed the footbridge and then headed up the path along the river back towards Buckden. 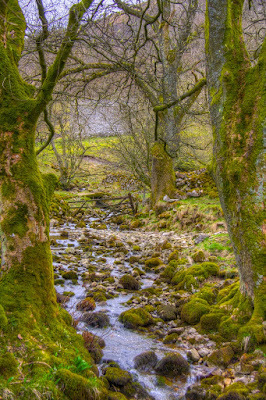 A little way along the river I took this photo of a little stream as it came through the woods towards the river. 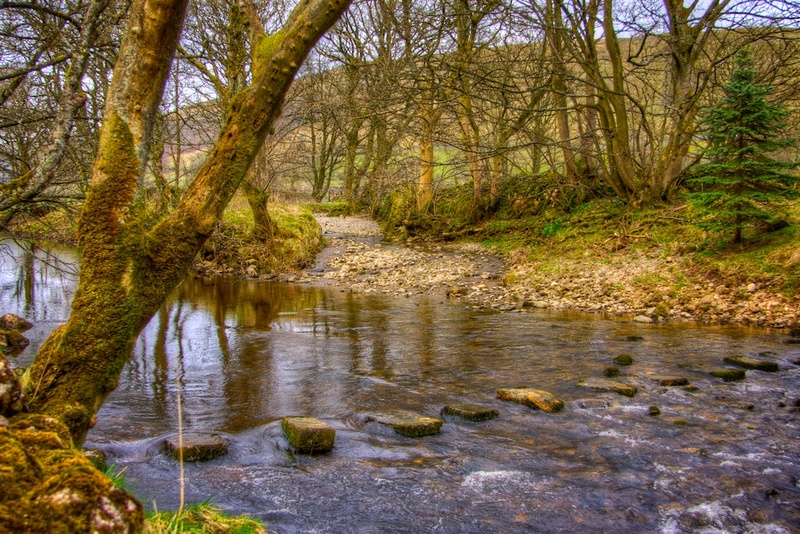 A little further along was these stepping stones across the river. And further along the path was this stream passing an old barn and through a gap in the old dry stone wall. 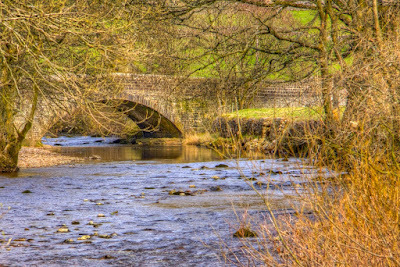 As we reached the end of the path near Buckden is this lovely old road bridge. It had been a good walk and a lovely day out with the family. You may have noticed that none of the photos include any of the family and this is purely because none of them like their photo taken. I didn't even get any photos of Evey the dog because she was busy chasing about and having fun. Here's a bit of video of her playing in the river.